Silver City knows how to throw a next-level printing party. Above: Silver City knows how to throw a next-level printing party. Photograph by Jay Hemphill. 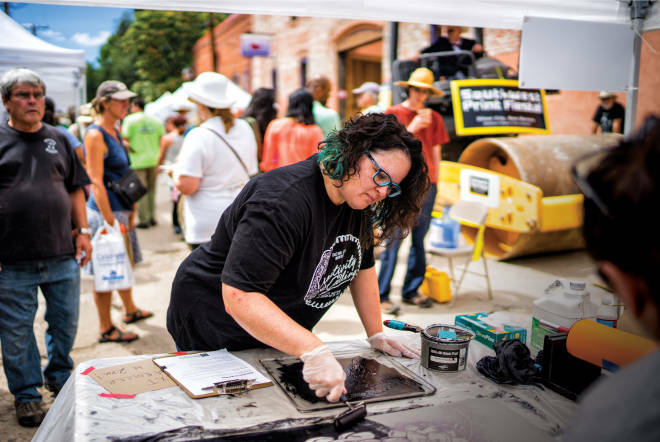 Get flattened by creativity during downtown Silver City’s Southwest Print Fiesta, October 5–7. Have your camera ready as artists use a steamroller to transfer ink from giant linoleum blocks to thick paper—and reveal unforgettable prints. At the Friday night welcome party, you can meet the four artists selected for the steamroller project and preview their hand-carved blocks. A juried exhibition opens that night with print works from all across the country. On Saturday, Bullard Street bulges with vendors showing off greeting cards, posters, art prints, T-shirts, and tote bags—while demonstrating their craft. Get your hands dirty on Sunday during one of the workshops and drop-in demonstrations at Power and Light Press and other arty spots.